It seems to be all the rage over the last few years for famous bands from the 80s to all get together and do reunion tours and nostalgia concerts. Thankfully one of my favourite bands from that era are being just a little more classy than that, and are back on tour on their own after a "break" of around 25 years. 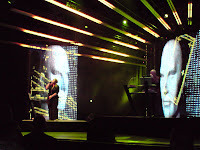 Yazoo are the dream team of synthesizer wizard Vince Clarke and powerhouse vocalist Alison Moyet. Famously only together for about 18 months between 1982-3, they took a very very long break after the release of their second album "You And Me Both" when communication problems arose between the two members. In 2008 they are back for a reunion tour to promote the release of the Mute box set "In Your Room", which contains remastered version of both albums, plus a third CD of B-sides and rarities, plus a DVD of 5.1 mixes of the albums and a short film about the history of the band. It's a bumper package and well worth checking out! I was lucky enough to get a ticket for one of the London gigs on the tour, Hammersmith Apollo, and although I was secretly apprehensive about it I was absolutely blown away by how good they were. Not only was the sound amazing, and the great lighting and visuals, but there just seemed to be a great atmosphere in the room which seemed to come directly from the band. They genuinely seemed happy to be out again performing these songs, some of which they never got the chance to play live. Highlights of the gig for me were "Sweet Thing", "Situation", and "The Other Side Of Love", which I strongly recommend checking out. I have it on good authority that the London gigs were recorded for a forthcoming live album.